Gramma is not as dedicated of a blogger as myself and my mom have turned out to be. 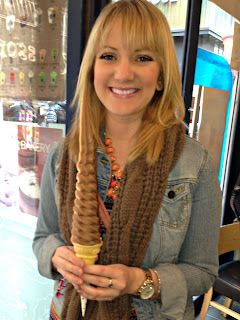 Alas, I am going to blog our adventures from the past day and a half... Since she left off at lunch on Friday, I'll pick up with Friday night when I got off work. I picked up Gramma from my apartment around 8:30 after walking home. 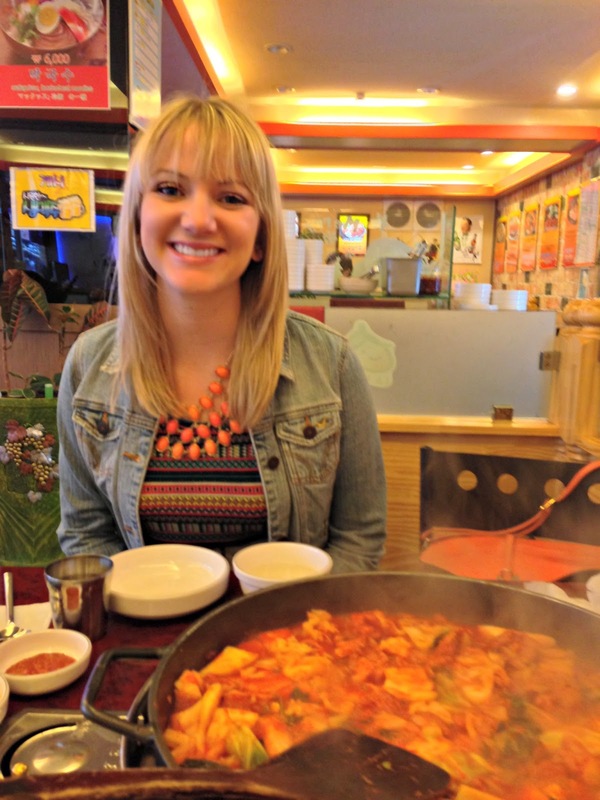 We went immediately to a restaurant to get my tried and true favorite Korean meal: galmaegisal. 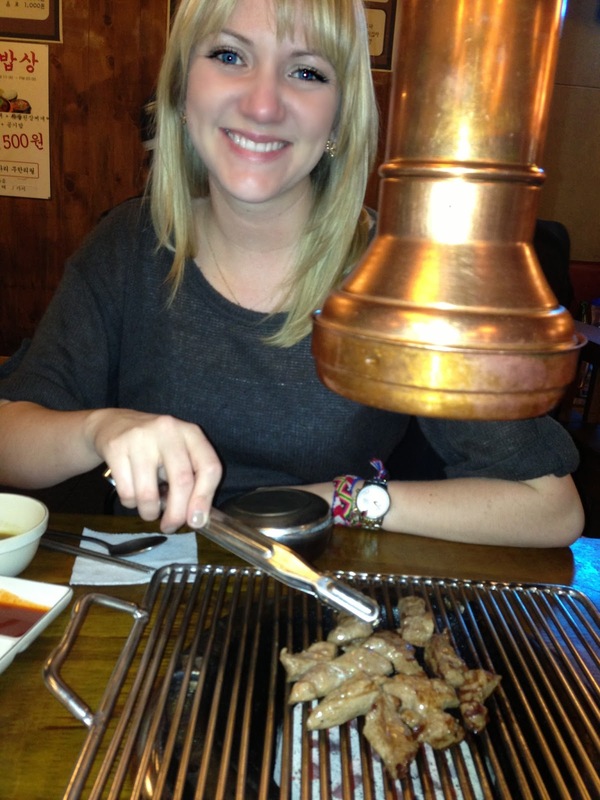 Supposedly this is pork skirt meat, but I am willing to put some won on it that my restaurant serves a cow variety... Anyway, it's my favorite meal and I decided that after a 3-week hiatus I was overdue for some deliciousness. And Gramma needed an awesome introduction to the fine cuisine here. We had a wonderful meal and she said she really enjoyed the food. 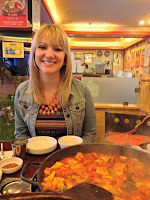 After our meal, we took a bus to Dongdaemun Night Market. I knew I wanted to take her, and since I got off an hour early Friday, I figured it was as good a night as any! When we got there, we went directly into apM which is one of the huge buildings that houses hundreds of little shops on 9 floors. I found some good buys! We also hit Migliore, which is the same idea/layout as apM, but different vendors. After that, we went across the street to the little individual popup tents that line the streets. Gramma ended up getting a necklace gift for one of her friends back home, and some socks. I left with 3 pairs of pants, 4 necklaces, a pair of shoes, 3 hair pins, and a dress. Yeah... I went a little nuts. We tried to get a cab back home around 12:30, but it proved a little difficult. We had to wait about 20 minutes before we found one who was both available and willing to pull over for us. We also had to walk several blocks before we found him. By then, we were ready to get home and get in bed! This morning we got up around 9am, and I was seriously lagging. I felt super tired, and I knew it would be a long day. 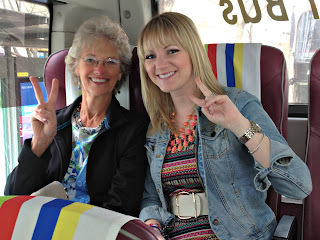 We got ready and headed out around 11am for the Seoul City Tour bus so that we could hit up the major sites to see all in one day. Since it was a hop on/ hop off, we decided to get off at 3 different places: Myeongdong (to try street food), one of the traditional Folk Villages, and Insadong (to check out the souvenir-y type stuff). 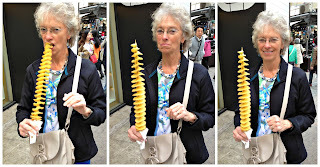 At Myeongdong, we had to search but eventually found what we were looking for: Potato Tornadoes! Gramma seemed to enjoy her snack/lunch. I mean, what's there NOT to love about these things!? I describe them as the best of potato chips meets the best of french fries. YUM. We then headed to the stop to get back on the bus. 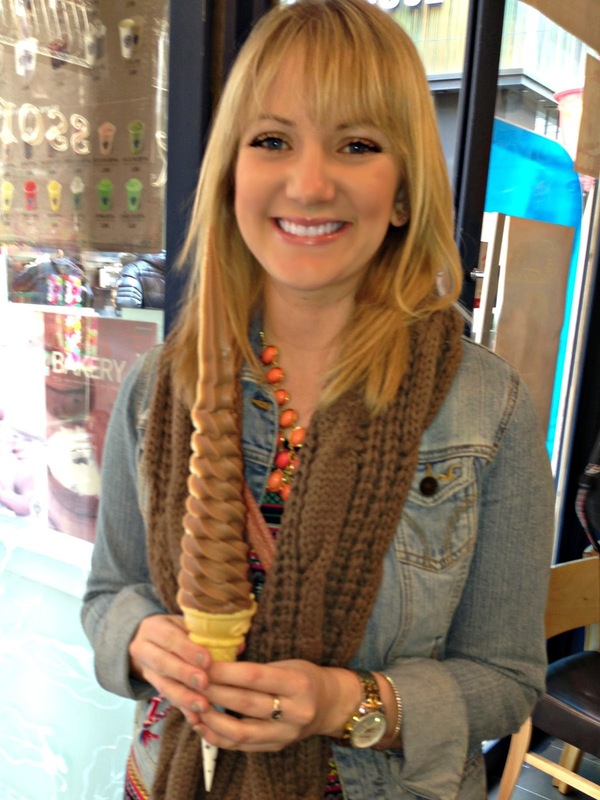 We had to wait for a little bit, and it was kind of windy so I ditched the ice cream with a few inches still to go. :( We got the bus to the next stop: Namsangol Traditional Folk Village. It was interesting but as there wasn't any English guide (that we found), we lost interest fairly quickly. We saw a little performance going on, and watched some guy jump around to the drums. The best part was the photos. 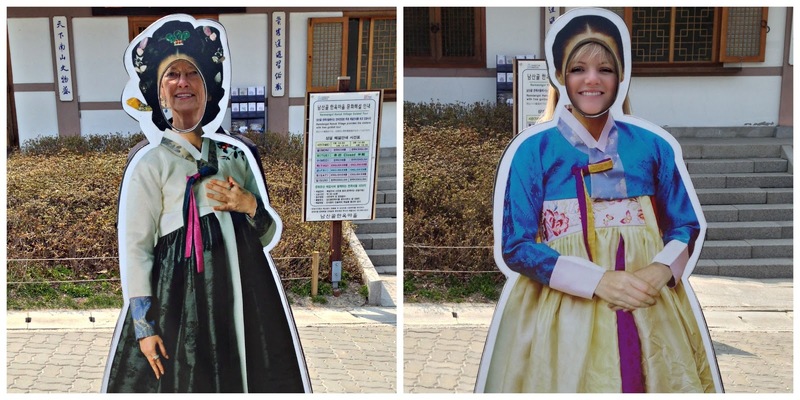 We got some cute ones of us in hanboks (the traditional Korean dress). Back to the bus and we slumped into the seats; we were exhausted. Including the bus tour thus far, we'd been out and about Seoul for around 4 hours. It doesn't seem like we should have been that exhausted, but we were! We sat on the bus for the next 45 minutes or so, driving by N Seoul Tower, Dongdaemun Market (which Gramma could then see in daylight), and other sites. We disembarked again at Insadong and strolled through Insadong St to check out all the goods and handicrafts. Gramma ended up getting some souvenirs and postcards, so it was a success. At the end of the road, we decided to just get the subway home rather than turning around to catch the bus for the last 4-5 stops. We headed back to my area of town. Whoa... Gramma does a great blog!! She IS a super adventurer - I'm so proud of her (but not surprised)! You two look really happy! And, I know you are . . . What cuties you both are! Know you're having a good visit - lots to do, lots to see. Exhausted? but, FUN.